The progestin-only birth control pill, also known as the minipill, is a type of oral contraceptive (birth control pill). Each progestin-only pill contains a small amount of progestin (which is a synthetic form of the hormone progesterone). These pills do not have any estrogen. The MiniPill only comes in a 28-day pack. All 28 pills contain progestin (there are no placebo pills). You take one pill every day for the 4-week cycle (pack). This way, you are getting a steady dose of the hormone. This means that you will have your period while you are still taking "active" pills. If you start your progestin-only pill on the first day of your menstrual cycle (and you typically have a 28-day cycle), you will most likely get your period during the first week of your next pack. But only about 50% of women who use the minipill will ovulate regularly, so there may be no way to predict when your period may occur. Progestin-only birth control pills do not regulate your cycle the same way that combination pills do. The amount of progestin in progestin-only pills is lower than the progestin dose in combination birth control pills. 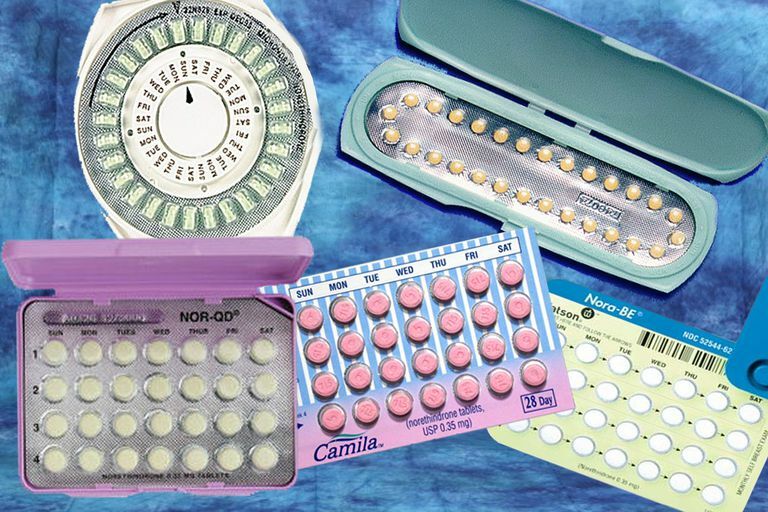 Progestin-only birth control pills are slightly less effective than the combined pill. The MiniPill tends to cause fewer side effects than combination contraception. Some women say that progestin-only birth control pills are harder to use than combination pills. This is because progestin-only pills must be taken at the same time each day. Because combination birth control pills are made up of progestin AND estrogen, you have a little more flexibility if you don't take your pill at exactly the same time. Progestin-only birth control pills mainly prevent pregnancy by changing the consistency of your cervical mucus. The progestin thickens your mucus, and this makes it much harder for sperm to swim through. The minipill may also work by thinning the lining of your uterus. This would make it less likely for implantation to happen. Progestin-only pills may also stop you from ovulating (this is the case for about half of the women who use them). Cigarette smokers over the age of 35. Women with a history of blood clots. Women who experience extreme migraine headaches. Progestin-only birth control pills can also be prescribed for breastfeeding mothers since the progestin will not negatively affect milk production or harm your baby during nursing. In fact, studies have shown that the minipill may actually help increase the amount of milk produced. Because the minipill contains less progestin than the combination birth control pill, the progestin's effect on your cervical mucus lasts for only about 24 hours. That is why it is important to take progestin-only pills at the same time every day. That being said, the progestin-only birth control pill is a very effective contraceptive. The minipill is 91%-99.7% effective. This means that with typical use, only 9 out of every 100 women will become pregnant during the first year of use. With perfect use, less than 1 will become pregnant. Trussell J. "Contraceptive failure in the United States." Contraception. 2011;83(5):397-404. Access via private subscription. What Is Lo Loestrin Fe and How Is It Different from Other Pills?